I survived a week in the wilderness! I spent seven days in the north woods of Wisconsin and two in the Twin Cities and managed to do very little of what I thought I would. I only read two books, I didn’t really do any writing, I let my work sit unfinished, I rarely even turned on my computer. It was kind of nice to unplug for a week and I wasn’t really that excited to come back, but alas, things were waiting for me. 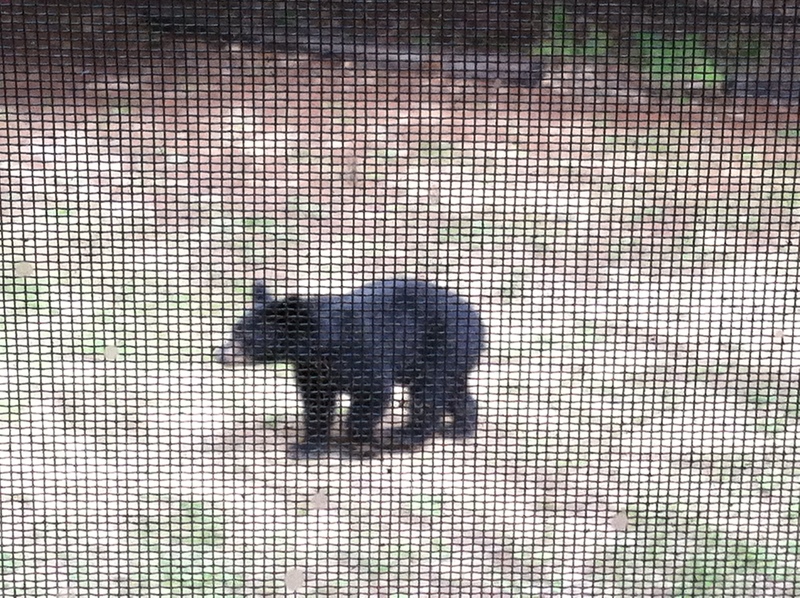 This bear cub walked right up to the house—no zoom was employed in the taking of this photo. Sorry the screen’s in the way; I didn’t want to go outside for fear Mama was close by. I saw a lot of wildlife on my trip, including a pair of bear cubs (no idea where Mama Bear was), a few bald eagles, a ton of loons and hummingbirds and other indigenous animals. I stayed at my family’s property with my immediate family—dad, stepmother, both brothers, and my sister-in-law—and we kept ourselves busy. (I think this is the first vacation we’ve managed with all of us in almost a decade; it’s certainly the first big family trip with my SIL. We don’t all end up in the same place that often.) I did some kayaking, we had one night where we cooked dinner over a fire, I saw some of my very extended family, I tasted wine at a winery, I went window shopping in a tourist-trap area. That’s about as rustic as I get. I am definitely a city girl at heart. It was nice to unplug, but it’s also nice to be back in the land of noise and people and concrete. And now I’m catching up—I missed a lot last week! And I got an idea for a book that I’m really excited about. I think my next project is going to be a historical either way, so you all have that to look forward to. My dad and I don’t talk as much as I wish we did, for a lot of complicated reasons. We’ve been in touch more often recently, mostly because my youngest brother has been in and out of the hospital. It’s a shame that we seem to only talk when things are not so good. My dad is not a big reader. I have more books in my bedroom than he’s got in his whole house, everything confined to two bookcases in the basement. And, even then, my dad’s books are mostly limited to home-improvement reference books and a Time-Life series on Vietnam (with which he is mildly obsessed despite not having served, but he was ROTC in high school and probably would have gone into the army had the decision not coincided with the outbreak of Vietnam and due dates for grad school applications). My stepmother has an uncle who is a prolific published writer, so there’s a shelf of his books, too. But that’s kind of it. And my dad’s stories of having skated through his English classes are the stuff of legend; he’s still kind of proud of the fact that he passed freshman English by flirting with the teacher. My dad was sick a lot when I was a kid with a chronic illness that has, against all odds, largely gone into remission now that he’s in his sixties. My youngest brother, as it happens, has been diagnosed with the same illness, but I imagine it must offer him some comfort to have Dad around to commiserate with. I’m grateful that my dad is still around to tell stories. It worries me sometimes that he fudges the details now, mixing up who was involved in the story, but we forgive him some senility and make jokes about his age. I think he finds his inability to recall some details frustrating. But then, when I spoke with him this afternoon, he sounded great, happy and preparing for a busy summer. I spent a few hours in my favorite neighborhood cafe this afternoon, plugging away at my current WIP. A number of men came in with their kids for lemonade or iced tea (it’s a hot one in New York today). The staff at the cafe was quick to offer all the dads a happy day, which I thought was sweet. I live in a neighborhood with a lot of young families, and it’s not in any way unusual to see men wheeling around strollers. 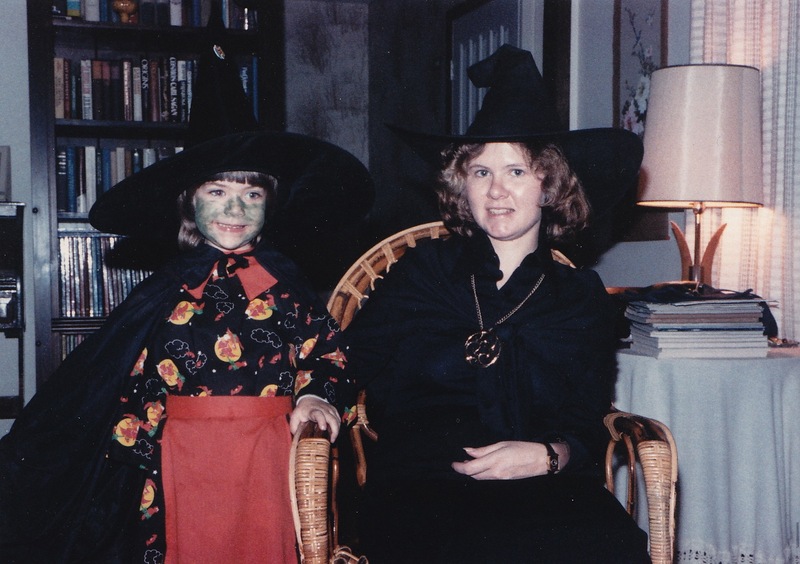 I went digging for a few old photos of my mother in honor of the holiday and came up with this one. It’s fitting in its way; every Halloween since forever, she’s dressed up as a witch. There was a box of old costumes that lived in our basement that had no fewer than 5 pointy hats in it at any given time. My mom is also a writer, though she writes mostly non-fiction these days. My dad is a scientist. As far as following in parental footsteps, it could have gone either way; I did pretty well in my English classes in school, but I also excelled at math. Still, I became an editor and a writer, just like my mother. Because, as maybe you can guess from the photo, a part of me wanted to be her. My mom was always trying to further our education. She has a keen interest in American history, so my brother and I got dragged around to reenactments and documentary screenings and war movies when we were kids. I probably got a better education in history from my mother than I did from school. In 10th grade, for example, I was assigned a paper on the Battle of Gettysburg, and I didn’t even have to go to the library because my mom had so many reference books on the Civil War. Some branches of my mother’s family have been in the US since the late 1600s, which maybe explains the preoccupation with American history and genealogy. My mother told me at our early Mother’s Day dinner last night that her brother has been doing some research and discovered that we had an ancestor who’d been imprisoned at Andersonville, the worst of the Confederate prison camps during the Civil War. My brother and I both exclaimed “Wow, cool!” (And my brother’s fiancée, who was also having dinner with us, gave us a blank stare. Although, she and my brother have been together a long time, and he’s about to go back to school to get an advanced degree in history, so she’s kind of used to this.) My mom had a similar reaction, though; it’s one of those things… Andersonville was, by all accounts, a terrible place. The man who ruled over it was hanged for war crimes after the war ended. My ancestor, in fact, died a few weeks after being liberated. But my brother and I got kind of a giddy thrill to know that an ancestor of ours had been a part of this chapter in American history that we knew something about. So there it is. Blame my mother.